Dieanna and Jim Swearingen sent me the below photo, which came down through the Jessie Brewer Jones and Levy Jones family, hoping for a possible ID. I was unable to make one at the time but I’m now of the opinion it is possibly a photo of Robert Walter Brewer and Edith S. Gilmore. 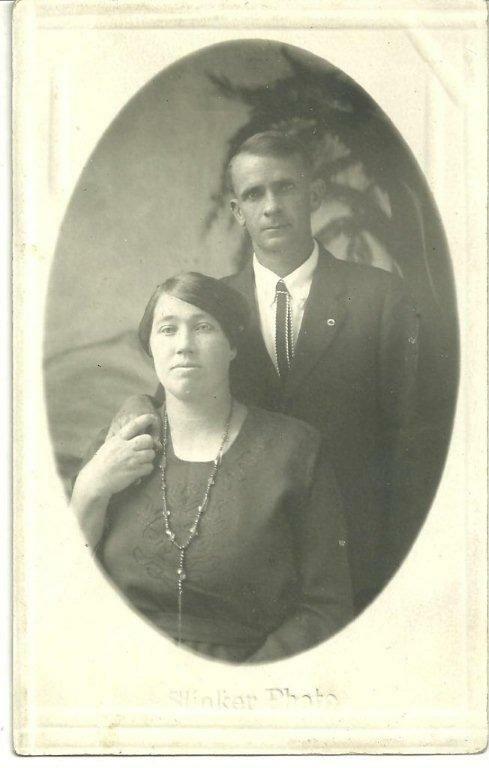 I have an earlier Brewer family photo that is of very poor xerox quality but shows Walter and it looks to be the same person, accounting for a difference in age and hair part. Thought the digital file had enough pixels to try for a touch up. Is that a lapel pin? I couldn’t tell so left it there. 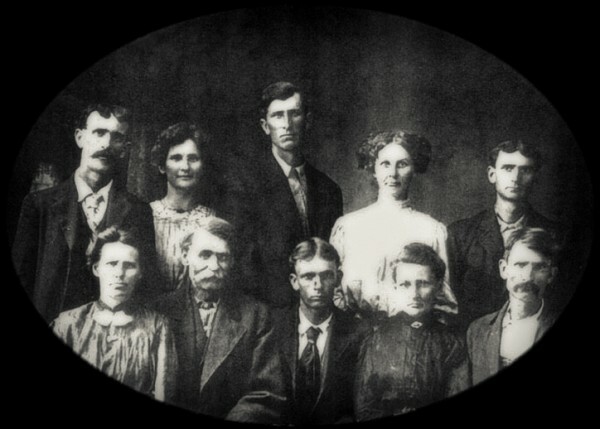 I am basing my identification of Walter by two other photos, one being a 1909/1910 family photo which shows Walter in the middle bottom row between his parents. More on that photo is here. 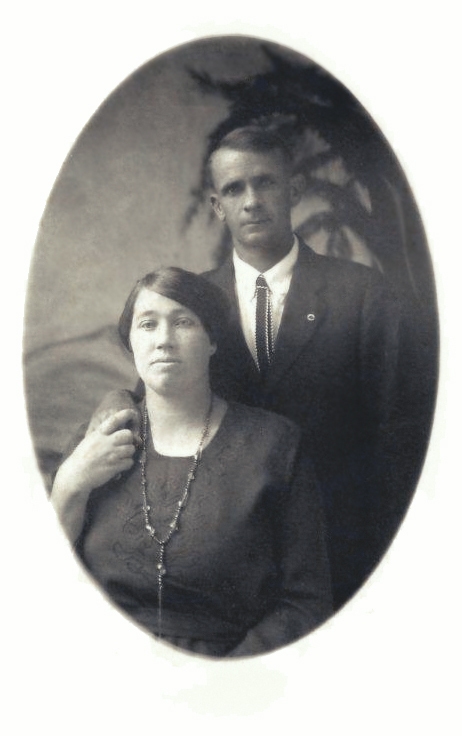 Robert Walter Brewer, son of David Nathaniel Brewer and Delana L. Jane Fowler, was a brother of my great-grandmother Bettie Brewer Noyes. 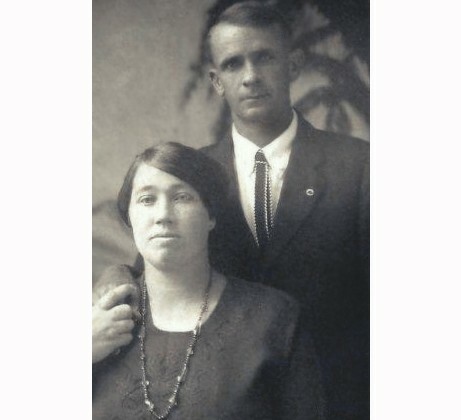 He was born 1890 Nov 15 in Barton county, Missouri and married Edith S. Gilmore who was born about 1894 in Missouri. The 1920 census shows Walter and Edith in North, Dade, Missouri. The 1930 census shows them in Polk, Dade, Missouri. Year: 1930; Census Place: Polk, Dade, Missouri; Roll: T626_1185; Page: 3B; Enumeration District: 12; Image: 0165. More information on the couple may be found here and by using the tags.